Graduate students Ryan Fitzsimmons, Katy Hosokawa, and Lilian (Gabby) Petty are enrolled in a soils class at the University of Northern Colorado (UNC). Their graduate project for the class is to choose a soil of interest in northern Colorado, and describe and collect it for study. 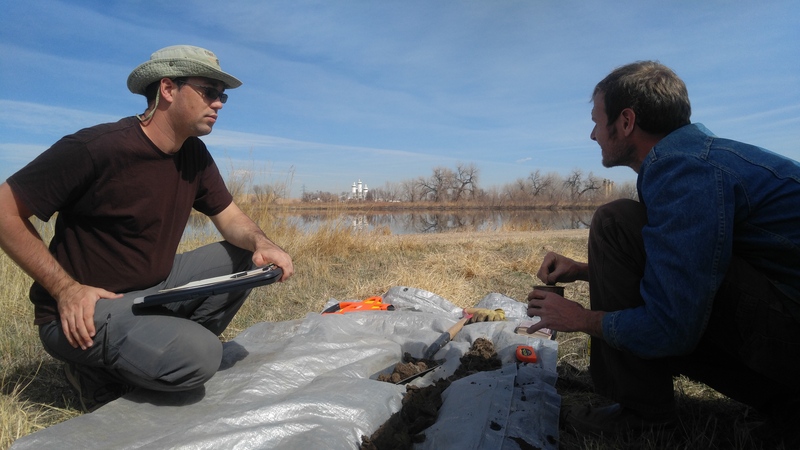 They were able to capture their soil samples with the generous help of Natural Resources Conservation Service-NRCS soil scientist Clark Harshbarger, and West Greeley Conservation District Field Technician Jasen Kettle and the NRCS’ Giddings Rig. The soil samples were collected at the Poudre Learning Center. in the lab at UNC. The students’ report will describe the soil’s color, structure, and horizionation in the field. Field work was completed on Thursday, March 16, 2017, and results from the laboratory experimentation are expected to be completed by late April.